"Indy - sticking her tongue out to cancer!" 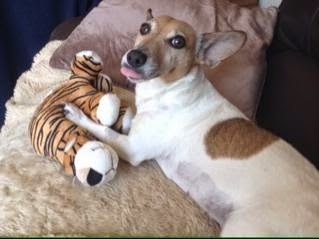 Indy is a 10-year-old Jack Russell Terrier residing in Slough, England; with her doting mother Wendy Phillips and family. As you would expect, Indy is a typically loveable yet crazy member of her breed. Bold, brazen, and with the exception of random ironing boards falling atop of her; due to an accidental scare in the early days, is fearless as they come. She is – like all dogs, a lover, and – unlike all dogs, loved in return; living the life any canine born onto this planet deserves without question. While loved by human hearts, the hand of nature has dealt her a much crueller blow; one I feel is worth documenting. Recently, the usual bouncy Indy had become lethargic and unwell. A quick trip to the vets and a dose of antibiotics later improved her condition, yet was still miles away from her usual effervescent self. Following deeper evaluation in the form of a blood test and X-ray, it was discovered Indy required surgery in the form of a splenectomy; due to a mass found on her organ. The worst possible news for her family, was followed by the dreaded phone call; explaining the genuine possibility she may not make it through the night; due to the excess blood loss. Indy however – loved, strong, and with the heart of a jack Russell, pulled through. Yet she was still diagnosed with blood cancer; in the form of lymphoma. With a lack of time to deduce whether her form was either the B or T cell; B responds to treatment, whereas T does not, and once she had regained some strength, her family scraped together as much money as they could, and agreed a course of reductive chemotherapy. In a short space of time she had gone from playful pet with a clean bull of health, to brave cancer fighting warrior. Unfortunately, and for anyone who has lived it or loved anyone who has will attest, it does literally change lives; and in my view explains why there is nothing more important in this world to fight than cancer... nothing. I write this article because in three weeks I run my first ever half-marathon (13.1 miles) here in England, in order to raise money for the charity, Animal Cancer Trust. Their mission is to encourage awareness, education, and work towards ridding the awful disease in animals; as much as we try to do for our own species, and lessen the blow of situations like Indy’s as much as possible. We as humans give so much of ourselves trying to defeat cancer, we often forget our precious pets are no more immune than we are. There are countless stories of a similar nature which take place across the globe on a daily basis; the majority are rarely heard, never seen, and are lived as a silent form of suffering within the close knit community of a family unit. Please donate, and help us reach the magical target of £1,000 for Animal Cancer Trust before June 8th, 2014. I can run the necessary miles, but every last charitable payment you donate, carries each step forward in both completing a marathon, and ultimately, defeating cancer! And should you have any stories of your own similar to these, please feel free to contact me via my Facebook page, and I will do my best to share each one, and raise awareness to your personal story. Thank you.